Growing “plant onions”. These are small onions that grow to large ones. In post 5 more about this. Sowing onions. You strew onion seeds in your garden. After germination small onion plants grow into big onions. In Holland I grow these onions in March. I sow onions and summer carrots in alternate rows. On these photos you can see that plant onions and onion seeds result in onions of about the same size, These onions grew last year in my garden. Big “plant onions” (of this species) have a “flat shape”. I store them in my cellar at about 12 to 18 C (53 to 64 F). In spring the onions start forming a stem and a flower. So less onion remains. Big onions (of this species) that grew from seed are more or less spherical. These onions form stems and flowers much later. So storage time is much longer. I noticed that onion flies troubled the “seed onions” less than the “plant onions”. In tip 4 more info about the onion flies. The soil in the furrow is lower, so less drying out. And less watering needed. 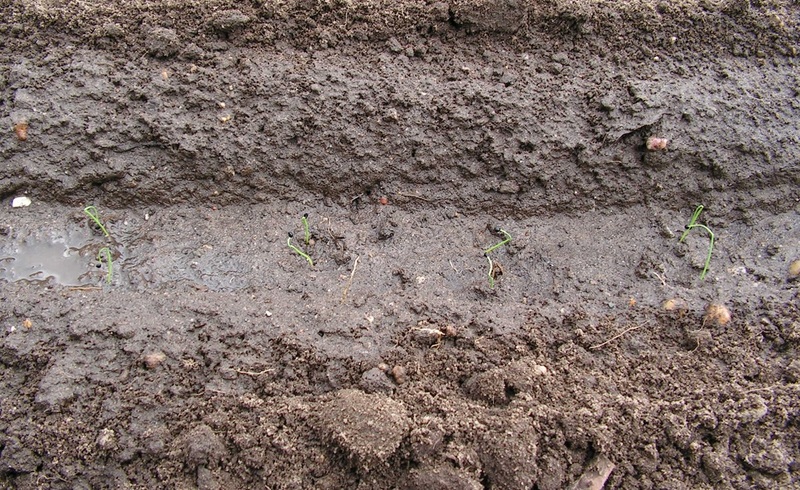 The furrow indicates where the onions have been planted or sown. No marks needed. 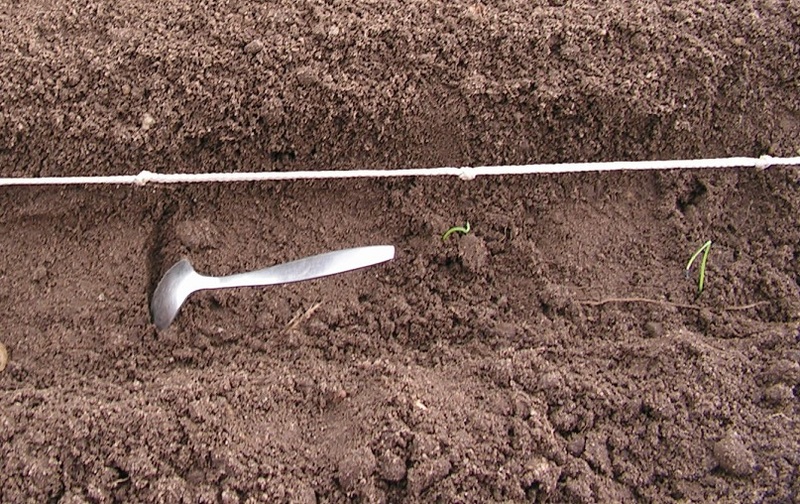 You can use a “furrow board” to make the furrow in the garden soil. More info about these boards in tip 2 (number 2). You can use a garden trowel or a plastic box or a piece of wooden board to make the furrow. 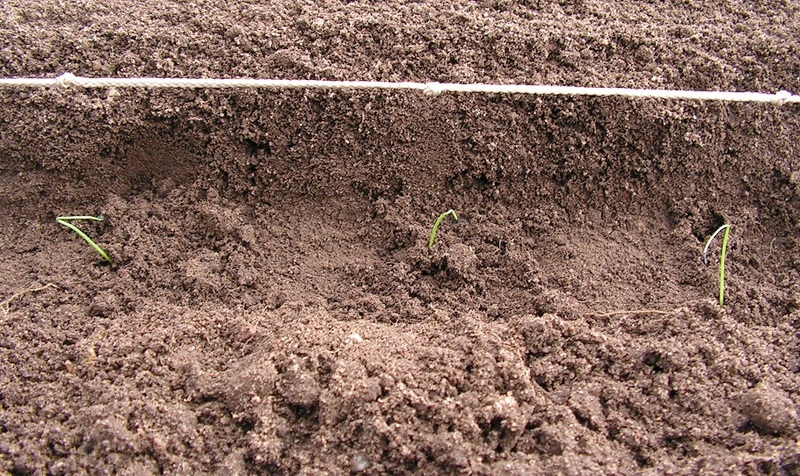 When planting onion sets, you van make a V-shaped furrow in the garden soil. Each 10 centimeters (4 inch) put one onion set in the garden soil “at the deepest point of the furrow”. When sowing onions, you can make a \__/ shaped furrow in the garden soil. Lay or scatter each 10 centimeters (4 inch) one short row or group of onion seeds on the bottom of the furrow. Each short row or group is across the direction of the furrow. 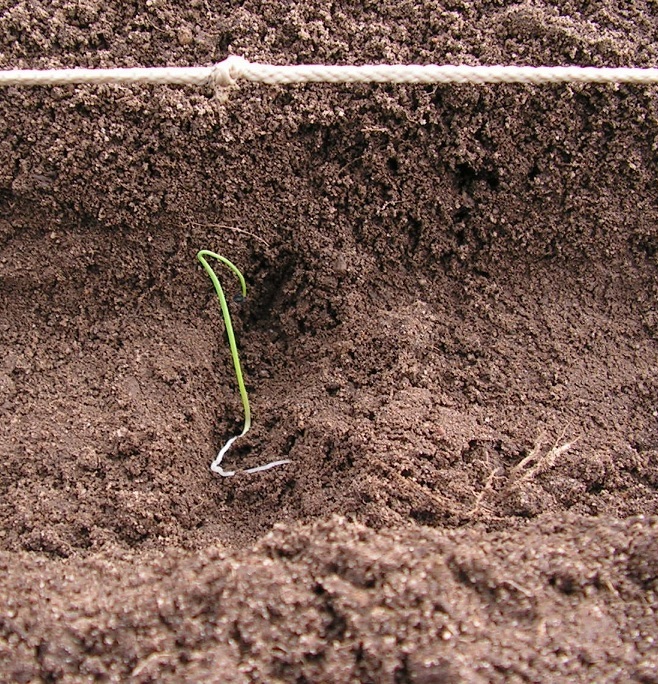 When planting mini-onions, you can make a \__/ shaped furrow in the garden soil. Put each 10 centimeters (4 inch) one or two min-onions in the bottom of the furrow. 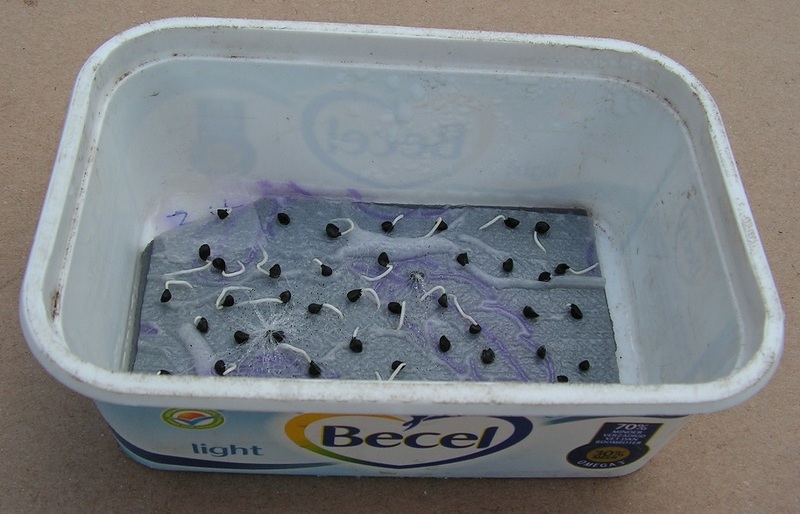 More info about this procedure in this tip at B1) Planting mini-onions. I use this species. Onion seeds are black and look like leek seeds. In Holland sowing time is begin of March to end of April (end of winter to early spring). You better buy or order new onion seed each spring. You can check how good the onion seed is. More about seeds and info on seed sachets in tip 40) . Onion seeds “of last year” germinate much worse than fresh (new bought) onion seeds. There is info on a seed sachet about the best sowing time. My advice; sow as early as allowed. It take a long time for a onion seed to grow into a big, harvestable onion. Sowing early means more chance of big, harvestable onions in late summer. Onions grow well in soil that has been manured “last year”. They grow well from the nutrients that are left in the soil after the crop of last year. When there was no manuring “last year”, you can mix the garden soil with compost before sowing onions or planting mini-onions or onion sets. You can sow dry onion seeds in the garden soil. That is the usual procedure. Most of the time not all seeds germinate, so not all onions crop up. Or tiny onion plants die. Most of the time you have to resow more onion seeds. You can germinate onion seeds on moist toilet paper. 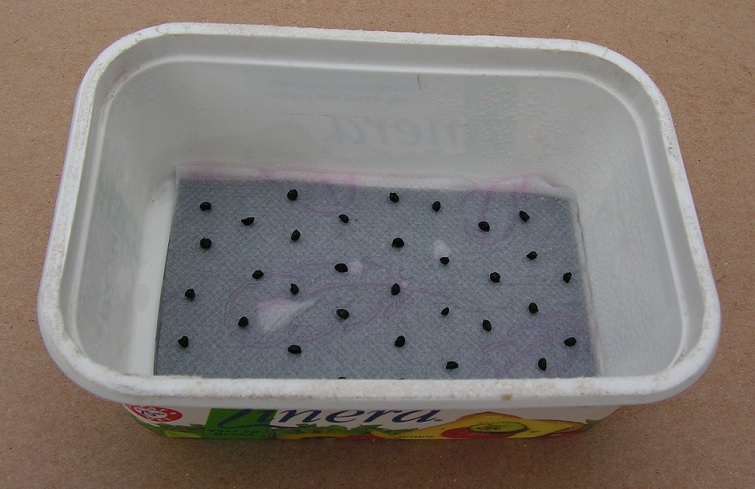 Next you can sow the germinated seeds (seeds with with tiny roots) on the garden soil. The bad, not germinated seeds are not sown on the soil. This works better than procedure 1. You can germinate onion seeds on moist toilet paper and let the onions grow bigger on the toilet paper. Next you can put the mini onions in the garden soil. This is the best procedure (my experience). 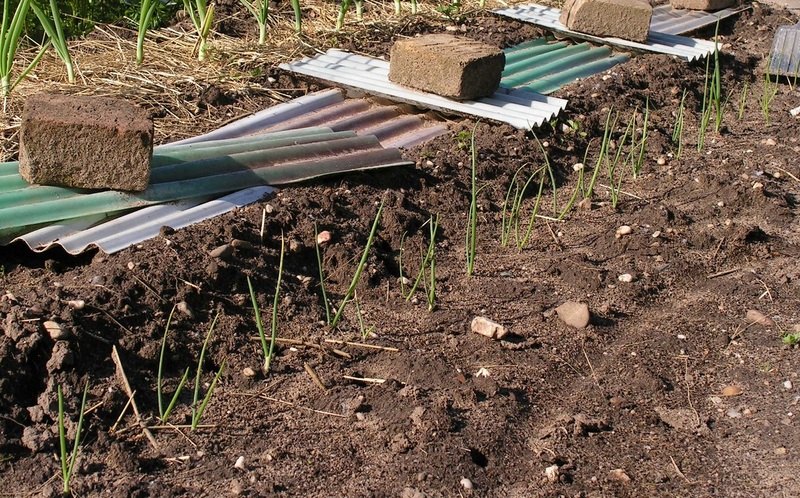 Below there are descriptions of these 3 ways of sowing/planting; first the planting of mini onions, next the sowing of germinated seeds and finally sowing dry onion seeds. Fold a little grey plastic plate in a sheet of toilet paper. This grey plate makes the germinating process better visible. Lay the folded toilet paper with folded grey plate in a small margarine box. Pour or spray cold tap water on the toilet paper in the box. Drain the water out of the box until dripping. Each spring use “fresh” onion seeds. “Last years onion seeds” do not germinate so well. Lay onion seeds on moist toilet paper. Put the original lid, or another well fitting lid on the box. Put the whole at a warm spot in your house (20 – 25 C, 68 – 77 F), for example on a central heating unit or above a radiator. Regularly lift the lid and check if there are onion seeds with a tiny white root. Put on the lid again. Regularly lift the lid and check if the toilet paper is moist. Hold the box slanting. When you see a little water in the corner of the box, the wetness of the paper is okay. If not, spray some water on the paper. Put on the lid again. Remove the lid when more than half of the seeds have a tiny root. (these onion seeds are not the same as on the photos above). 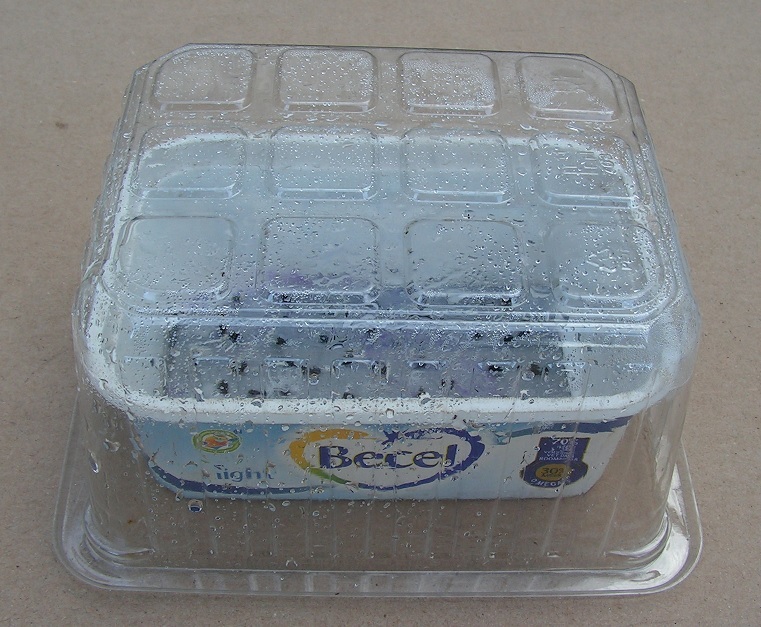 Put a transparent plastic box over the margarine box with germinating onion seeds. Put the whole indoors at a light place at about 20 C (68 F). For example on a broad window-sill. 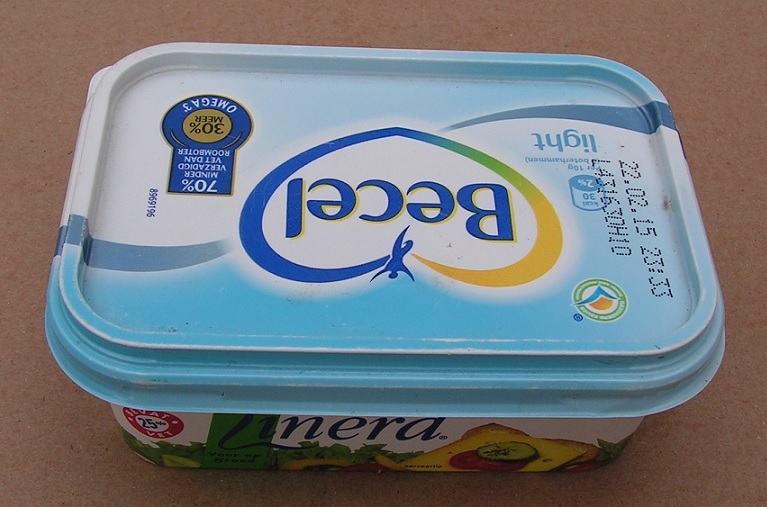 Push the transparent plastic box “completely down” over the margarine box, so the edge of the transparent box touches the window-sill. Under the transparent box there are narrow air openings, so the toilet paper does not dry so fast. Let the onion plants on the moist toilet paper grow bigger. Take care that the toilet paper does not dry up. When needed spray or pour water on the paper. Then push the transparent box “completely down” again. When the toilet paper looks light grey, the paper has dried (too) much. Then spray or pour water on the paper to “rescue” the onion plants. Thanks to the moist lower piece of toilet paper (folded under the grey plate), onion plants do not die immediately. The onion plants will grow on again, most of the time. 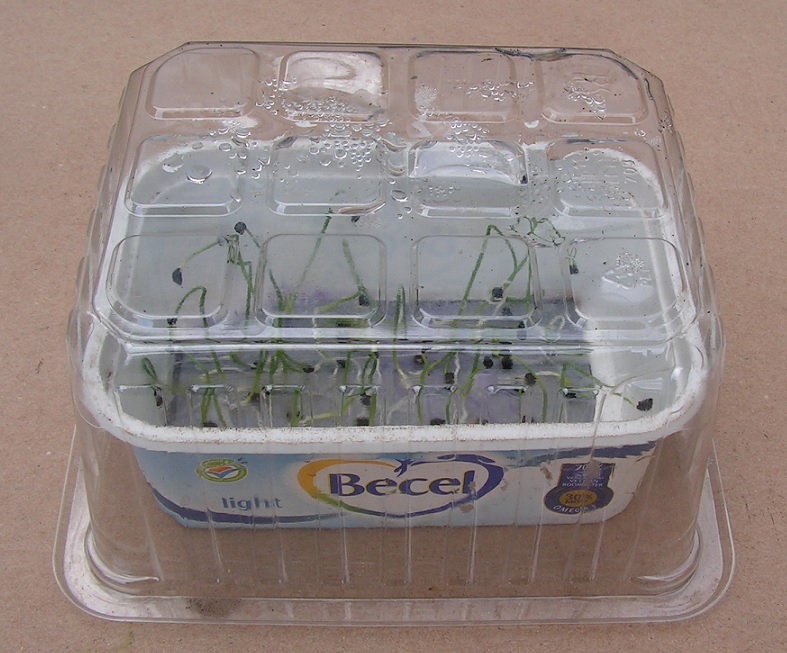 When the biggest onion plants are above the upper edge of the margarine box, you can replant the biggest mini onions. Spray water on the toilet paper. This eases the picking of the mini onions from the toilet paper. Use a garden trowel or a garden fork to make the garden soil loose. 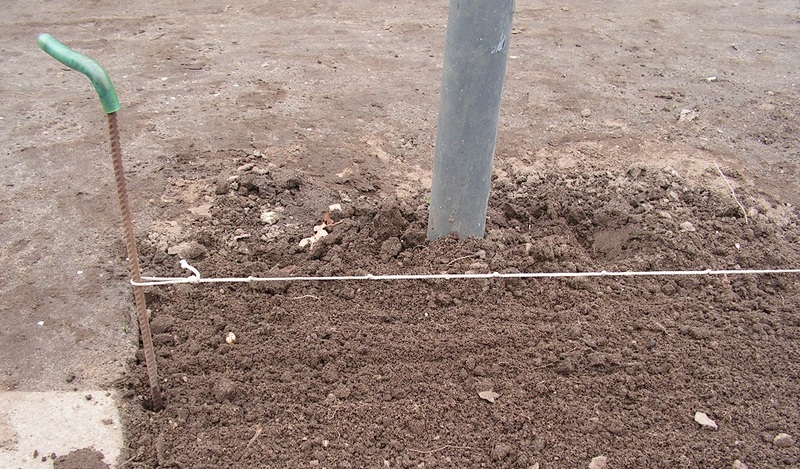 Put a (nylon) string above the loose garden soil. A string with knots each 10 centimeters (4 inch) is very useful. Make a furrow in the garden soil. 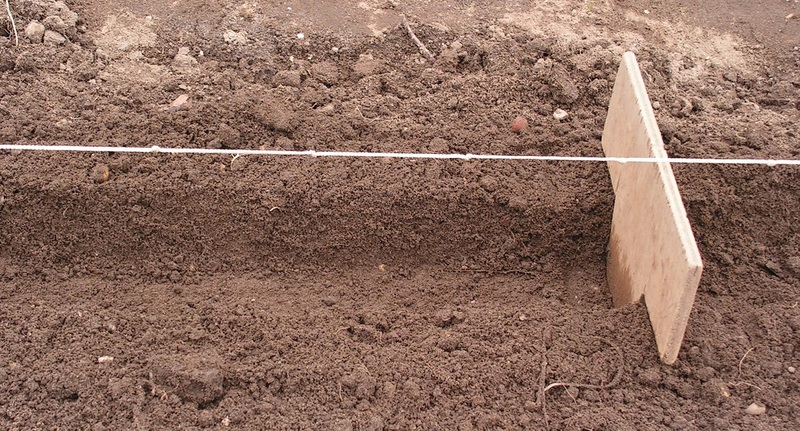 You can use a furrow board or a plastic box. Info about furrow bords in tip 2 , nr 2. At each knot in the nylon string (each 10 centimeters, each 4 inch) make a small groove across in the bottom of the furrow. You can use a tea spoon to do that. Pick one mini onion (between thumb and index) from the moist toilet paper. Put the mini onion in the small groove. Hereby you can bend or dislocate the root a little. You can also shorten the root and put the mini onion with shortened root in the small groove. Use a tea spoon to shove garden earth on the root and against the stem of the mini onion. 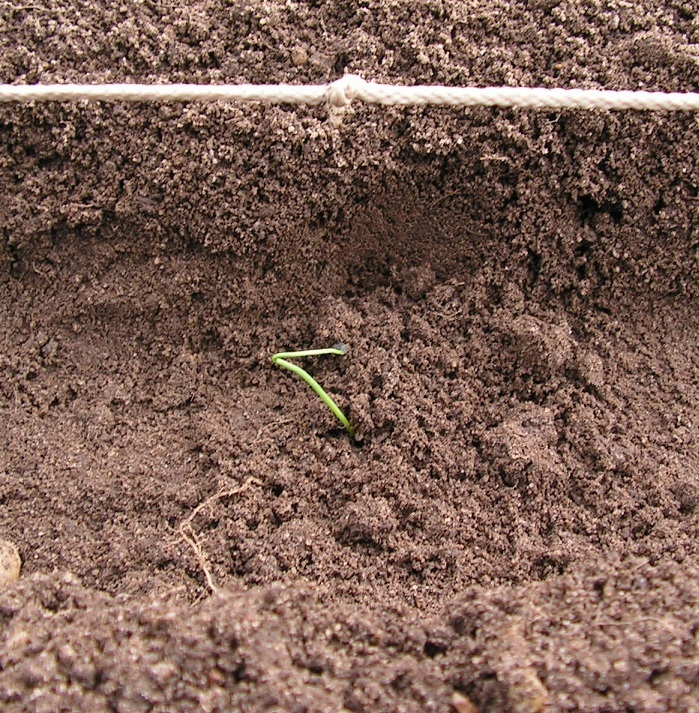 Use the same procedure to plant more mini onions in the furrow, with 10 centimeters (4 inch) spacing. Continue until the furrow is ” full”. Or continue until there are no more big mini onions. Let the remaining mini onions grow bigger on the moist toilet paper under the transparent plastic box. The can be replanted later. Use a watering can with a “fine sprinkler head” to spray water in the furrow. 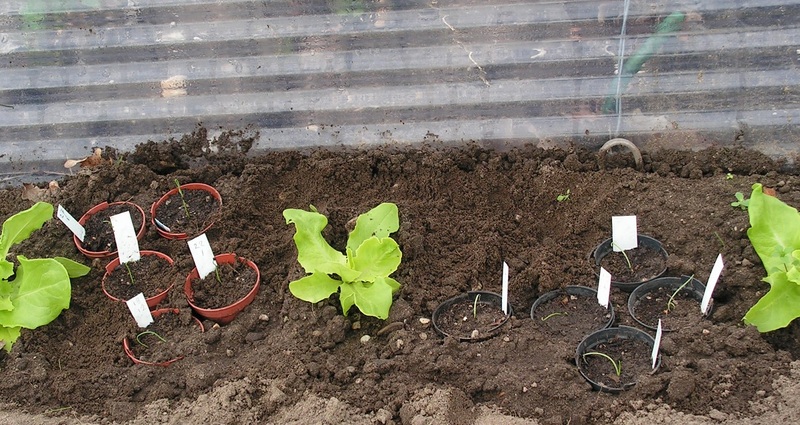 Cover the furrow with transparent plates or transparent mini tunnels. See further in this chapter. Het gebeurt vaak dat in een voortje enkele uienplantjes niet doorgroeien. Die uienplantjes blijven klein, kleuren geel, verdrogen, “breken af”, raken beschadigd of zijn gewoon verdwenen. Je kunt later op die plekjes de slechte uienplantjes weghalen en reserve uienplantjes planten. Vul enkele kleine bloempotjes (met inzet en stripje) met compost. Gebruik de grote mini-uienplantjes die over zijn (op het vochtig wc-papier groeien) als alle mini uienplantjes in het voortje zijn geplant. Plant in elk bloempotje een mini uienplantje. Zet de bloempotjes met mini uienplantjes onder een golfplaattunnel in de tuingrond of voor een raam in huis. Laat de plantjes groter groeien. Haal daarna de slechte uienplantjes weg uit het voortje. Haal de reserve uienplantjes uit de bloempotjes. Plant de reserve uienplantjes met wortelkluit in het voortje op de lege plekken. Je kunt ook om de 10 cm twee uienplantjes naast elkaar planten. Als één uienplantje later dood gaat, dan heb je er nog één over. Blijven er twee uienplantjes in leven, dan kun je later het kleinste plantje vlak boven de grond afknippen. Of gewoon beide plantjes groot laten groeien. Op deze foto’s zie je telkens twee uienplantjes bij elkaar staan. Gebruik een gietertje met een fijne broes. “Zwiep” met de broes over de plantjes heen; dan blijven de plantjes overeind tijdens het water sproeien. Onions grow well in soil that has been fertilized during former season. 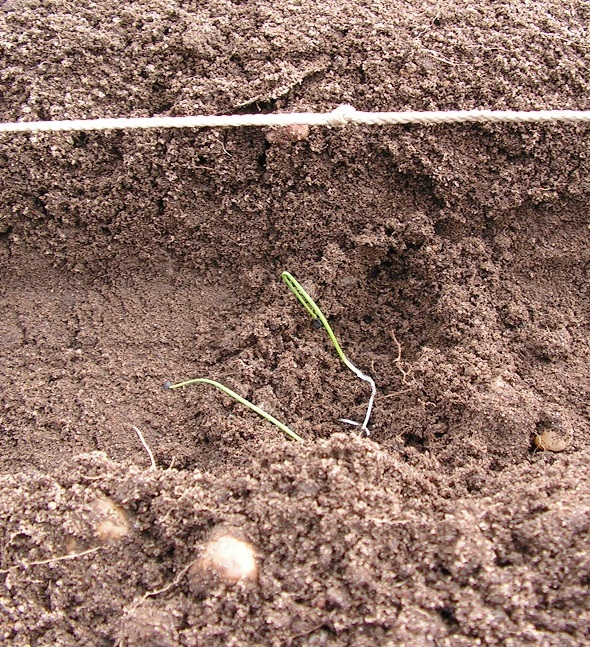 Onions grow from nutrient residues in the soil. You can also put some compost in the ground before sowing. I sow in a shallow furrow, about 3 inch wide, 2 inch deep. At post 6 you can read the advantages of a furrow (less drying out of the earth, easier watering). Start on loose (spaded) garden soil. Photo 1: Lay stepping boards on the ground against tamping the earth. Photo 1: Use a string or rubber band to work in a straight line. Make a shallow furrow with a “furrow board”, approx. 3 inch wide and 3 inch deep. Photo 2: Water the furrow using a watering can with a fine shower. Photo 3: Lay a lath with distant marks against the edge of the furrow. Photo 4: Strew seeds in a (white) box so you can clearly see the seeds. Use fingers, tweezers or a cocktail pin during sowing. A cocktail pin with moist point works well. Photo 5: Each time lay a group of 6 onion seeds in the furrow. 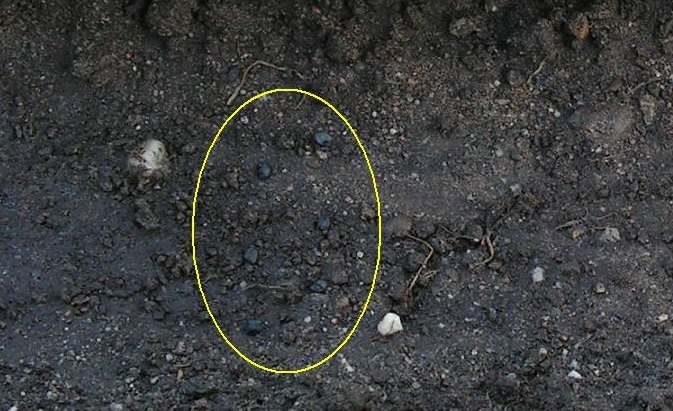 Distance between the groups in the furrow is about 4 inch. The text on the sachet says 1 seed each 2 inch and thinning out later. But onions can grow that big that 2 inch distance is too less. Each 4 inch I sow 6 seeds. 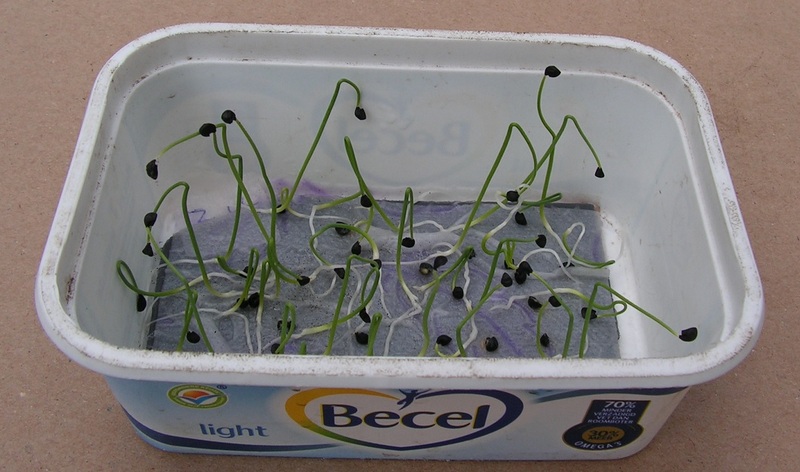 In 2012 I found that onion seeds do not germinate that easy. And there are many onion seeds in a sachet. Each spring I buy fresh, new onion seeds. Onion seeds older than 1 year do not germinate so good. 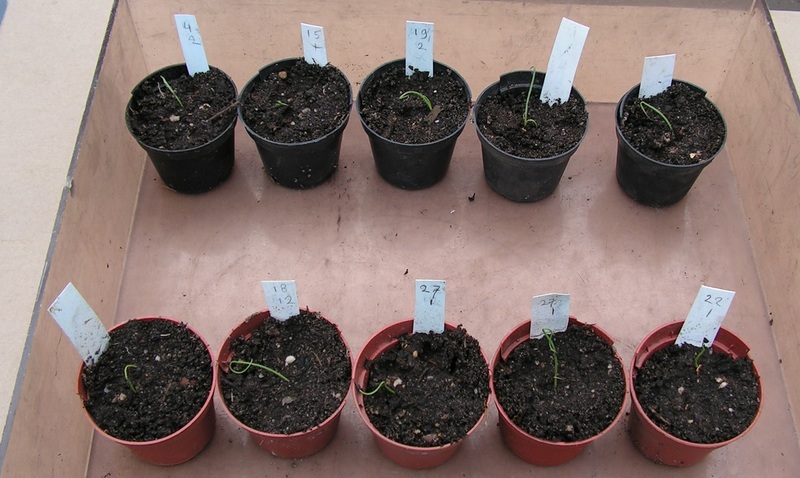 In each group 1,2,3,4,5 or 6 onion plants will grow. After some weeks I remove the smallest plants from each group until 2 biggest onion plants are left. Then water the plants. And some weeks later I remove the smallest plant so the biggest onion plant remains. Then water the plants. When sowing 1 seed at 2 inch distance this can cause missing plants in the row when some seeds do not germinate. Then s s s s s s s s s s s s s can result in p p p p p p p p (s = onion seed p = onion plant). For ease I put a short satay stick of a match in the furrow near the lath with marks. After sowing 6 seeds of a group I put the stick at the next mark. In this way I can see where to sow. You can also make groups of 3 germinated onion seeds. Or alternately 3 germinated onion seeds and 3 germinated winter carrot seeds. Get some moist earth somewhere else in the garden. If needed remove the dry top layer first. Crumble the earth and strew it in the furrow on the seeds. Layer thickness about 1/4 to 1/2 inch. Hoe the soil next to the row after removing the stepping boards. In spring it can be very cold. After sowing you can lay pieces of transparent currigated plate over the furrow. These are about 6 inch wide (and 2,5 to 3 feet long). Lay bricks on them against blowing away. Between two plates there is 1 to 3 inch space for air refreshment. Seeds are in a furrow so there is also some space between plates and seeds. You can also use plates of perspex or other material. This entry was posted in early, onions. Bookmark the permalink.